In economics Keynesian economics , also Keynesianism and Keynesian Theory, is based on the ideas of twentieth-century British economist John Maynard Keynes. According to Keynesian economics the public sector, or the state, can stimulate economic growth and improve stability in the private sector—through, for example, interest rates, taxation, and public projects. The theories forming the basis of Keynesian economics were first presented in The General Theory of Employment, Interest and Money, published in 1936. It was his explanation for the cause of the Great Depression for which he was, deservedly, most well known. Although Keynesian theories no longer adhere to many of the points of Keynes' original or even later work, it is through their continuing change and development that they continue to hold sway today. In John Maynard Keynes' theory, some micro-level actions of individuals and firms—if taken collectively—can lead to aggregate macroeconomic outcomes in which the economy operates below its potential output and growth. Such a situation had previously been referred to by classical economists as a general glut. Following in Say's Law, that supply creates its own demand, classical economists believed that a "general glut" would therefore be impossible. Keynes contended that a general glut would occur when aggregate demand for goods was insufficient, leading to an economic downturn. This would lead to unnecessarily high unemployment and losses of potential output. Keynes asserted that unemployment can be readily cured through governmental deficit spending, and that inflation can be checked by means of government tax surpluses (Rothbard 2008). In other words, he argued that government policies could be used to increase aggregate demand, thus increasing economic activity and reducing high unemployment and deflation. The basic concept, used in his theory, is aggregate national income, which is defined as equal to the money value of the national output of goods and services during a given time period. It is also equal to the aggregate of income received by individuals during the period (including undistributed corporate profits). Keynes' macroeconomic theories were developed in the context of mass unemployment in 1920s Britain and in 1930s America. This means that the only way any individual can receive any income in the form of money is for some other individual to spend an equal sum. Conversely, every act of expenditure by an individual results in an equivalent monetary income for someone else. In every case, expenditures, and only expenditures, can create monetary income. Final expenditure for goods and services that have been produced during the period, which equals consumption. Expenditure on the means of production of these goods, which equals investment. Thus, monetary income is created by decisions to spend, consisting of consumption decisions and investment decisions. This relationship between aggregate income and consumption is considered to be stable, fixed by the habits of consumers. In the mathematics of Keynesian theory, aggregate consumption (and therefore aggregate savings) is a stable, passive function of income. This is known as the consumption function. For example, according to the consumption function, we can say consumption equals 90 percent of income. Thus, savings would be equal to 10 percent of income. Consumption expenditures are, therefore, passively determined by the level of national income. Investment expenditures, however, are, according to Keynes, effected independently of the national income (Rothbard 2008). income = independent expenditures (private investment + government deficit) + passive consumption expenditures. Using our illustrative consumption function, income = independent expenditures + 90 percent of income, then income equals ten times independent expenditures. Similarly, a decrease in independent expenditures will lead to a ten-fold drop in income. This "multiplier" effect on income will be achieved by any type of independent expenditure—whether private investment or government deficit (such as foreign trade problems). Therefore, government deficits and private investment have the same economic effect. The existing state of all techniques, the existing efficiency, quantity, and distribution of all labor, the existing quantity and quality of all equipment, the existing distribution of national income, the existing structure of relative prices, the existing money wage rates, and the existing structure of consumer tastes, natural resources, and economic and political institutions are constant too (Rothbard 2008). From this it follows that for every level of national income, there corresponds a unique, definite volume of employment. The higher the national income, the greater will be the volume of employment, until a state of "full employment" is reached. After the full-employment level is reached, a higher money income will represent only a rise in prices, with no rise in physical output (real income) and employment. Also, income below this "full-employment" level will signify large-scale unemployment; an income above will mean high price inflation. There is no reason whatsoever to assume that this equilibrium level of income determined in the free market will coincide with the "full-employment" income level. It may be more or less. Thus, the government must be involved. If the system it is below the "full-employment" level, the state can engage in deficit spending until the desired income level is reached. The injection of income results in more spending in the general economy, which in turn stimulates more production and investment involving still more income and spending and so forth. The initial stimulation starts a cascade of events, whose total increase in economic activity is a multiple of the original investment (Blinde 2002). During the Great Depression, classical theory defined economic collapse as simply a lost incentive to produce. Mass unemployment was caused only by high and rigid real wages. The Keynesian relation between income and employment depends upon the assumption that the techniques (or technologies), the quantity and quality of equipment, and the efficiency and wage rate of labor are fixed over long periods. In other words, "the assumption of constant money wage rates means that in the Keynesian model, an increase in expenditures can only increase employment if money wage rates do not rise and employment can only increase if real wage rates (i.e. wage rates relative to prices and to profits) fall" (Rothbard 2008). In this, his theory agrees with classical economists. On the other hand, both Keynesians and liberal economists recognized that money wage rates, particularly since the advent of the New Deal, are no longer free to fall due to monopolistic governmental and trade union control of the labor market. To Keynes, nominal wage cuts would be difficult to put into effect because of laws and wage contracts. Even classical economists admitted that these exist; but unlike Keynes, they advocated abolishing minimum wages, unions, and long-term contracts, increasing labor-market flexibility. Keynes, however, argued that people will resist nominal wage reductions, even without unions, until they see other wages falling and a general fall of prices. Keynes also argued that to boost employment, nominal wages would have to fall more than prices. However, doing so would reduce consumer demand, so that the aggregate demand for goods would drop. This would in turn reduce business sales revenues and expected profits. Investment in new plants and equipment—perhaps already discouraged by previous excesses—would then become more risky, less likely. Instead of raising business expectations, wage cuts could make matters much worse (Keynes 1936). Further, if wages and prices were falling, people would start to expect them to fall. This could make the economy spiral downward as those who had money would simply wait as falling prices made it more valuable—rather than spending. As Irving Fisher argued in 1933, in his Debt-Deflation Theory of Great Depressions, deflation (falling prices) can make a depression deeper as falling prices and wages made pre-existing nominal debts more valuable in real terms. Investment is influenced by the level of income, by the expected course of future income, by anticipated consumption, and by the flow of savings. For example, a fall in savings will mean a cut in the funds available for investment, thus restricting investment. Classics on Saving and Investment. 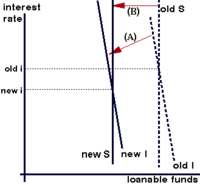 The classical economists argued that interest rates would fall due to the excess supply of "loanable funds." This was the original Keynesian position, too, in which he followed both Malthus and John A. Hobson (1889). The first diagram, adapted from the only graph in The General Theory, shows this process (Einbond 1995). Assume that fixed investment in capital goods falls from "old I" to "new I" (step a). Second (step b), the resulting excess of saving causes interest-rate cuts, abolishing the excess supply: so again we have saving (S) equal to investment. The interest-rate fall prevents the drop in production and employment. Later on, however, excessive savings became Keynes’ preoccupation; he believed that excessive saving had been Britain's and the United States’ principal problem in the late 1920s, encouraging recession or even depression, so that only a demand-side kick could re-stimulate the economy (Hutchinson 2005). The graph below summarizes his argument, assuming again that fixed investment falls (step A). First, saving does not fall much as interest rates fall, since the income and substitution effects of falling rates go in conflicting directions. Second, since planned fixed investment in plant and equipment is mostly based on long-term expectations of future profitability, that spending does not rise much as interest rates fall. So S and I are drawn as steep (inelastic) in the graph. Given the inelasticity of both demand and supply, a large interest-rate fall is needed to close the saving/investment gap. As drawn, this requires a negative interest rate at equilibrium (where the new I line would intersect the old S line). Keynes on Saving and Investment. Keynes, as it follows from the graph, felt that especially in a depression, a reduction in an interest rate will have little effect on savings. If people prefer liquidity, savings will not be reduced no matter how the interest was (Keynes 1936). As a recession undermines the business incentive to engage in fixed investment. With falling incomes and demand for products, the desired demand for factories and equipment (not to mention housing) will fall. This accelerator effect would shift the I line to the left again, a change not shown in the diagram above. This recreates the problem of excessive saving and encourages the recession to continue. However, some Keynesians now appear to accept the importance of savings, even excessive savings as it always returns to the investment (even in the next time period) for economic growth (Mankiw 1997, Bernanke 2002). 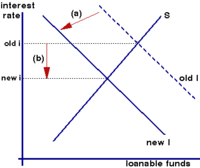 Of particular importance in Keynes' early years was the role of fiscal policy. Keynes' theory suggested that active government policy could be effective in managing the economy. Rather than seeing unbalanced government budgets as wrong, Keynes advocated, what has been called, countercyclical fiscal policies. That is, policies which acted against the tide of the business cycle—deficit spending when a nation's economy suffers from recession, or when recovery is long-delayed and unemployment is persistently high, and the suppression of inflation in boom times by either increasing taxes or cutting back on government outlays. Keynes argued that governments should solve problems in the short run rather than waiting for market forces to do it in the long run, because "...in the long run, we are all dead..." (Keynes 1935). Michael Polanyi (1945) concluded that the policy conclusions of the General Theory simply amounted to claiming that monetary expansion, by lowering interest rates, would be sufficient to increase output and employment. However, many of the early Keynesians (including Keynes himself), objected to the assertion that monetary policy was, in itself, sufficient to guarantee full employment. During the 1930s, interest rates had fallen considerably, yet it did not seem as if private investment was instigated into action. This was understandable: with so much excess capacity, the incentives to build even more capacity would be very little, even if financing was very cheap. As a result, many Keynesians recommended that fiscal policy, increasing government spending or lowering taxes, would have to come in and fill the gap. Alvin H. Hansen (1941) took this idea and developed his famous "stagnation thesis." Loosely speaking, Hansen argued that the 1930s represented the "closing of the American frontier" and that, henceforth, there would be far fewer investment opportunities available than before. With the amount of profitable investment projects reduced permanently, Hansen concluded, the economy could no longer rely on private investment to increase employment, output and growth. The government, Hansen noted, did not require "profitability" to initiate building projects. Consequently, government fiscal policy will (and ought to) be henceforth responsible for a permanently larger portion of economic activity. Saving has no special efficacy as compared with consumption, in releasing cash and restoring liquidity (Keynes 1938, 321). where Y is nominal income (GDP), k is the multiplier, s is the marginal propensity to save, and Z is some "autonomous" expenditure, such as investment or government expenditure that does not depend on domestic savings. Keynes (1933, 1936), by his elaboration of Richard Kahn's (1931) earlier argument, thus exalts consumption spending to a magical significance in macroeconomic analysis, contrary to the classical emphasis on production and saving for investment in order to promote the growth of output and employment. Such popular claims as "the current U.S. economic expansion is being driven by consumer spending" also reflects the Keynesian multiplier view (Akhiaphor 2001). The "Cambridge Keynesians," also known as the Cambridge "Circus," refers to the group of British economists inspired by John Maynard Keynes's General Theory. The five members at Cambridge—Joan Robinson, Richard Kahn, Piero Sraffa, Austin Robinson, and the visiting member James Edward Meade—began meeting to discuss Keynes' Treatise on Money when it was published in 1930. They continued meeting and discussing successive drafts of his General Theory before it was published. In fact, it was their questioning, arguing, and general challenging of orthodox economic assumptions that led to the "revolution" in economic thinking that characterized Keynes' General Theory when it was published in 1936 (Pasinetti 2007). Geographically more distant, but no less important for the later development of Keynesian economics, were contemporary young economists at other universities in England at that time. These included Roy F. Harrod at Oxford and Nicholas Kaldor and John Hicks at the London School of Economics (LSE). These were the first to expand upon Keynes' work and make it known beyond Cambridge. Joan Robinson (1903-1983) embodied the "Cambridge School" in most of its issues in the twentieth century: as a cutting-edge Marshallian before and after 1936; as one of the earliest and most ardent Keynesians and finally as one of the leaders of the Neo-Ricardian and Post-Keynesian schools. Robinson's early contributions tended to be fundamental extensions of Neoclassical theory, such as her expository article on the Neoclassical marginal productivity theory of distribution (1934). However she made a quick turnaround, prompted by Keynes’ General Theory. As a member of Keynes's "Circus" at Cambridge during the writing of that treatise, Robinson produced early faithful expositions of Keynes' theory (1936, 1937). Although not exactly entranced by the labor theory of value, Robinson's 1942 Essay on Marxian Economics was among the first studies to take Karl Marx seriously as an economist. Austin Robinson (1897-1993) was the husband of Joan Robinson, and also an economist at Cambridge. A close associate of Keynes, Robinson served as assistant editor during Keynes' period as editor of the Economic Journal; following Keynes' retirement in 1944, Robinson took over the joint editorship with Roy Harrod. Richard Kahn (1905-1989) was a student of Keynes who then taught at Cambridge. He was involved in the genesis of Joan Robinson's work on imperfect competition. Arguably, Kahn's most notable contribution to economics was his principle of the multiplier—the relation between the increase in aggregate expenditure and the increase in net national product (output). The multiplier effect refers to the idea that an initial spending rise can lead to an even greater increase in national income. In other words, an initial change in aggregate demand can cause a further change in aggregate output for the economy. It is the increase in aggregate expenditure (for example government spending) that causes the increase in output (or income). This multiplier effect became the centerpiece of the Keynes' General Theory. Kahn was a "fundamentalist" Keynesian, and strongly rejected efforts to unite Neoclassical and Keynesian economics that stretched away from the original message of the General Theory. Piero Sraffa (1898-1983) was brought by Keynes to Cambridge in the 1920s. Sraffa has been sometimes considered a "closet Marxian." He was part of the legendary "cafeteria group" which explored Keynes' 1921 Treatise on Probability. Sraffa joined Keynes against Friedrich Hayek in the business cycle debates. Sraffa's Production of Commodities by Means of Commodities (1960) spearheaded the Neo-Ricardian School at Cambridge and elsewhere in the 1960s and 1970s. Joan Robinson’s work on growth paralleled and complemented that of Nicholas Kaldor (1908-1986). Together, they developed what became known as "Cambridge growth theory." After Keynes's General Theory appeared in 1936, Kaldor abandoned his LSE roots and joined the Keynesian Revolution. His seminal contributions to Keynesian theory include the concept of "own rates of interest" and dynamic effects of speculation (Kaldor 1939). An outgrowth of his intense debate with Friedrich Hayek was his construction of the "Cambridge" approach to growth theory (Kaldor 1961, 1962) which invoked several Ricardian concepts and was to become central to Neo-Ricardian and Post-Keynesian theory. Roy Harrod (1900-1978), an Oxford economist, was also included in Keynes' circle of correspondents. His urging of a "dynamic" rather than "static" approach to economic issues was an Oxford contribution, accepted only later among the Cambridge economists. His career had taken the strangest turns of all. A two-year delay (1928 to 1930) in the publication by Keynes (then editor of the Economic Journal) of Harrod's original "marginal revenue curve" denied the Oxford economist primacy in this field. Another independent discovery by Harrod (1931), effectively the long-run envelope of short-run average cost curves, also went unrecognized—the credit being awarded to Jacob Viner. In that same article, he laid out the analytical foundations for the theory of imperfect competition—for which Joan Robinson took the credit. Finally, the laurels for his remarkable multiplier-accelerator model, developed in his Trade Cycle (1936) in which the equations of the IS-LM model were written down by Harrod, were given to the mathematically-expressed versions by Samuelson and Hicks based on Hicks' (later) drawing of the diagram. Although he spent only a short time at Cambridge, his career being at Oxford, he remained in close touch for the rest of Keynes' life, serving as his official biographer. He published Keynes' biography in 1951. Although not an official member of the "Circus," Michael Kalecki (1899-1970), claimed to have anticipated much of the principles stated in Keynes' General Theory. Between 1929 and 1936 he worked for the Institute of Studies of Economic Conditions and Prices (Instytut Bada_ Koniunktur Gospodarczych i Cen) in Warsaw, during which time he wrote some of his most famous works. Unfortunately, as he published these in Polish or French rather than English, his contributions remained unrecognized until much later. Kalecki's claim of precedence to Keynes, in a 1936 article, likewise went into oblivion as the article was not translated into English. In 1936 he moved to England where he first worked at the LSE and later at Cambridge, collaborating directly with Keynes on an economic plan of rationing under wartime conditions. His later work incorporated several Classical and Marxian concepts, relying to a good extent on "class conflict," income distribution, and imperfect competition, items which would inspire the Cambridge Keynesians—particularly Joan Robinson, Nicholas Kaldor, and Richard M. Goodwin—as well as modern American Post-Keynesian economics. It was shown in above, for the Keynesian model to be valid, the two basic determinants of income, namely, the consumption function and independent investment, must remain constant long enough for an equilibrium of income to be reached and maintained. At the very least, it must be possible for these two variables to remain constant, even if they are not generally constant in actuality. The core of the basic fallacy of the Keynesian model is, however, that it is impossible for these variables to remain constant for the required length of time (Rothbard 2008). When income = 100, consumption = 90, savings = 10, and investment = 10, the system is supposed to be in equilibrium, because the aggregate expectations of business firms and the public are fulfilled. In the aggregate, both groups are just satisfied with the situation, so that there is allegedly no tendency for the income level to change. But aggregates are meaningful only in the world of arithmetic, not in the real world (Rothbard 2008). Business firms may receive in the aggregate just what they had expected; but this does not mean that any single firm is necessarily in an equilibrium position. Individual firms do not make earnings in the aggregate. Some may be making windfall profits, while others, technologically and managerially lagging firms, may be making losses. Regardless that, in the aggregate, these profits and losses may cancel each other (which in real-world of ever growing productivity is highly improbable to start with), each firm will have to make its own adjustments to its own particular experience. These adjustments (improvements in production processes, new technology, new products that would agree with changing tastes of the consumers) vary widely from firm to firm and industry to industry. In fact, these changes will have eventually impact on the whole industry, as the technologically lagging firms will chase the forerunners. In this situation, the level of investment cannot remain at 10, and the consumption function will not remain fixed, so that the level of income must change. Nothing in the Keynesian system, however, can tell us how far or in what direction any of these variables will move. Similarly, in the Keynesian theory of the adjustment process toward the level of equilibrium, if aggregate investment is greater than aggregate saving, the economy is supposed to expand toward the level of income where aggregate saving equals aggregate investment. In the very process of expansion and technological innovation, however, the consumption (and savings) function cannot remain constant. Windfall profits will be distributed unevenly (and in an unknown fashion) among the numerous business firms, thus leading to varying types of adjustments. These adjustments may lead to an unknown increase in the volume of investment. Also, under the impetus of expansion, new firms will enter the economic system, thus changing the level of investment. As saving is not independent of investment, most of it, particularly business saving, is made in anticipation of future investment. Therefore, a change in the prospects for profitable investment will have a great influence on the savings function, and hence on the consumption function. Consumption is not just a function of income; it depends, in a complex fashion, on the level of past income, expected future income, the phase of the business cycle, the length of the time period under discussion, on prices of commodities, on capital gains or losses, and on the consumers’ cash balances and, most of all, on changes of consumers’ preferences, tastes and utility expectations. Similarly, investment is influenced by the level of income by the expected course of future income, by anticipated consumption, and by the flow of savings. For example, a fall in savings will mean a cut in the funds available for investment, thus restricting investment. However, the most problematic part of the Keynesian model is the assumed unique relation between income and employment. This relation assumes that techniques, technologies, the quantity and quality of equipment, and the efficiency and wage rate of labor are fixed. This assumption leaves out factors of basic importance in economic life and can be true only over an extremely short period. Keynesians, however, attempt to use this relation over long periods as a basis for predicting the volume of employment. One direct result was the Keynesian fiasco of predicting 8 million unemployed after the end of the war (Rothbard 2008). In the post-WWII years, Keynes's policy ideas were widely accepted, with the substantial help of his followers. For the first time, governments prepared good quality economic statistics on an ongoing basis and had a theory that told them what to do. In this era of new liberalism and social democracy, most western capitalist countries enjoyed low, stable unemployment, and modest inflation. Paul Samuelson used the term "neoclassical synthesis" to refer to the integration of Keynesian economics with neoclassical economics. The idea was that the government and the central bank would maintain rough full employment, so that neoclassical notions centered on the axiom of the universality of scarcity—would apply. It was with John Hicks that Keynesian economics produced a clear model which policy-makers could use to attempt to understand and control economic activity. This model, the IS-LM model, is nearly as influential as Keynes' original analysis in determining actual policy and economics education. It relates aggregate demand and employment to three exogenous quantities, namely the amount of money in circulation, the government budget, and the state of business expectations. This model was very popular with economists after World War II because it could be understood in terms of general equilibrium theory. This encouraged a much more static vision of macroeconomics than that described above. The second main part of a Keynesian policy-maker's theoretical apparatus was the Phillips curve. This curve, which was more of an empirical observation than a theory, indicated that increased employment, and decreased unemployment, implied increased inflation. Keynes had only predicted that falling unemployment would cause a higher price, not a higher inflation rate. Thus, the economist could use the IS-LM model to predict, for example, that an increase in the money supply would raise output and employment—and then use the Phillips curve to predict an increase in inflation. Then, with the oil shock of 1973, and the economic problems of the 1970s, modern liberal economics began to fall out of favor. During this time, many economies experienced high and rising unemployment, coupled with high and rising inflation, contradicting the Phillips curve's prediction. This stagflation meant that the simultaneous application of expansionary (anti-recession) and contractionary (anti-inflation) policies appeared to be necessary, a clear impossibility. This dilemma led to the end of the Keynesian near-consensus of the 1960s, and the rise throughout the 1970s of ideas based upon more classical analysis. "New Keynesianism," associated with Gregory Mankiw and others, is a response to Robert Lucas and the new classical school. That school criticized the inconsistencies of Keynesianism in the light of the concept of "rational expectations." The new classicals combined a unique market-clearing equilibrium (at full employment) with rational expectations. The New Keynesians use "microfoundations" to demonstrate that price stickiness hinders markets from clearing. Thus, the rational expectations-based critique does not apply. The New Keynesians assumed that wages and prices cannot be adjusted instantly, which implies that the economy may fail to attain full employment. Because of this market failure, and other market imperfections considered in their models, New Keynesian economists argue that demand management by the government or its central bank can lead to more efficient macroeconomic outcomes than laissez faire policy would. However, New Keynesian economics is somewhat more skeptical of the benefits of activist policies than traditional Keynesian economics was. New Keynesian economists fully agree with New Classical economists that in the long run, changes in the money supply are neutral. However, because prices are sticky in the New Keynesian model, an increase in the money supply (or equivalently, a decrease in the interest rate) does increase output and lower unemployment in the short run. The decadent international but individualistic capitalism, in the hands of which we found ourselves after the war, is not a success. It is not intelligent, it is not beautiful, it is not just, it is not virtuous – and it doesn’t deliver the goods. In short we dislike it, and we are beginning to despise it. But when we wonder what to put in its place, we are extremely perplexed (Keynes 1933). Eventually, Keynes presented a whole new set of ideas in his General Theory (Keynes 1936). There he claimed that capitalism tends to run an equilibrium "between workers and the economy at less than full employment." Underconsumption, he said, stems in great measure from a mal-distribution of income. Saving and investment are non-related, and saving amounts to hoarding and is, in effect, anti-social. Three issues in his work that remain controversial are worthy of comment: inflation, macroeconomics, and Keynesian treatment of the state. Keynes argued that depression—more specifically, unemployment—was the offspring of the failure of consumption demand and the failure of investment demand. Hence, underconsumption (or underspending) was the economic culprit. 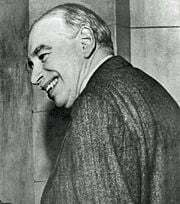 Hence Keynes’ slogans became "let us spend ourselves into prosperity" and, "avoid the temptation of saving." The argument was that if too little private spending caused unemployment, then more public "compensatory" spending would create employment. However, debt or deficit spending involves, almost invariably, inflation; that much every economist in his time knew. Keynes’ method of macroeconomics was one of aggregate thinking. For example, using the GNP as a statistical sum of inflated currencies based on assumed sellers’ prices. Furthermore, he made assumptions of constants in economic activity when there are only variables. The assumption that individual people are numbers with no independent will of their own created no room for any serious prediction of any economic activity. I expect to see the State, which is in a position to calculate the marginal efficiency of capital-goods on long views and on the basis of the general social advantage, taking an even greater responsibility for directly organizing investment (Keynes 1936). Clearly, government can "compensate" private spending, and hence, eventually, it must over-compensate. Again, government can invest, but, inherently, it cannot disinvest. In other words, power does not, cannot, and will not dissolve itself. Power, unless checked, can move, but in one direction, that of more power (Peterson 1959). Although many of his ideas did not stand the test of time, due to their popularity and revolutionary nature Keynes is still considered one of the founders of modern theoretical macroeconomics. While Keynesian economics as Keynes envisioned it no longer holds sway, there are many who continue to develop his ideas and so Keynesian economics continues to influence the world. Ahiakpor, James C. W. 2001. On the Mythology of the Keynesian Multiplier: Unmasking the Myth and the inadequacies of Some Earlier Criticisms - Focus on Economic Theory - John Maynard Keynes. American Journal of Economics and Sociology 60(4): 745-773. Retrieved February 10, 2009. Bernanke, Ben S. 2002. Deflation: Making Sure "It" Doesn't Happen Here, Before the National Economists Club, Washington, D.C. The Federal Reserve Board. Retrieved February 10, 2009. Blinder, Alan. Keynesian Economics. Concise Encyclopedia of Economics. Retrieved February 10, 2009. Einbond, A. 1995. To what extent was Keynes' General Theory revolutionary and to what extent was it based on past economic theories. The Concord Review. Fisher, Irving. 1933. The debt-deflation theory of great depressions. Econometrica 1: 337-57. Hansen, Alvin H. 1941. Fiscal Policy and Business Cycles. New York, NY: Norton. Harrod, Roy F. 1951. The Life of John Maynard Keynes. London: Macmillan. Kaldor, Nicholas. 1939. Speculation and Economic Stability. Review of Economic Studies. Kaldor, Nicholas, and J. A. Mirrlees. 1962. A new model of economic growth. Review of Economic Studies. Kalecki, Michal. 1935. Essai d'une theorie du mouvement cyclique des affaires. Revue d'economie politique. Kahn, Richard F. 1931. The relation of home investment to unemployment. Economic Journal. Keynes, John Maynard. 1933. An Open Letter to President Roosevelt. New York Times. December 31, 1933. Retrieved December 9, 2008. Keynes, John Maynard. 1930. National Self-Sufficiency. The Yale Review 22(4): 755-769. Retrieved February 10, 2009. Keynes, John Maynard. 1935. Commemoration of T. R. Malthus. Economic Journal. Keynes, John Maynard. 1937. The General Theory of Employment. Quarterly Journal of Economics. Keynes, John Maynard. 1938. Mr. Keynes's Consumption Function: A reply. Quarterly Journal of Economics - reply to Holden. Mankiw, N. Gregory. 2001. The inexorable and mysterious tradeoff between inflation and unemployment. The Economic Journal. Peterson, H. William. 1959. The Legacy of Lord Keynes address, given to the British Society For Individual Freedom. Freedom First September 14, 1959. Polanyi Michael. 1945. Full Employment and Free Trade. Cambridge, UK: Cambridge University Press. Ricardo, David. 1951. The Works and Correspondence of David Ricardo. Piero Sraffa and M. H. Dobb (eds.). 11 volumes. Cambridge: Cambridge University Press. Robinson, Joan. 1934. What is Perfect Competition? Quarterly Journal of Economics. 49(1): 104-120. Robinson, Joan. 1936. The Long Period Theory of Employment. Journal of Economics. 7(1): 74-93. Robinson, Joan. 1937. Essays on the Theory of Employment. New York, NY: Macmillan. Robinson, Joan. 1941. Rising Supply Price. Economica. 8: 1–8. Rothbard, Murray, N.,  2008. Spotlight on Keynesian Economics. Ludwig von Mises Institute. Retrieved February 10, 2009. "We are all Keynesians now," Time, December 31, 1965. This page was last modified on 16 April 2018, at 16:15.